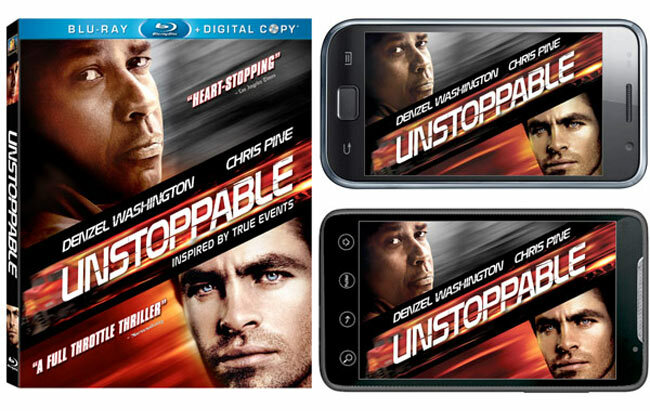 The film ‘Unstoppable’ staring Denzel Washington and Chris Pine will be launched tomorrow and a Blu-ray Digital Copy will be available for the Android platform for the first time ever. To access the Blu-ray Digital Copy on Android, you will need the ‘Unstoppable’ Blu-ray disc, a wi-fi connected Blu-ray player, Android 1.6 or higher, and the PocketBLU app, which can be downloaded free from the Android Market. UNSTOPPABLE is an electrifying action-thriller that follows Oscar-winner Denzel Washington* and Chris Pine (Star Trek) as they try to derail an unmanned, half-mile-long runaway freight train transporting deadly toxic material. Only two men can stop the train that is barreling towards Scranton, Pennsylvania: a veteran engineer (Washington) and a young conductor (Pine.) Thousands of lives hang in the balance as these ordinary heroes attempt to chase down one million tons of hurtling steel and prevent an epic disaster. Helmed by visionary director Tony Scott (Man On Fire), this story inspired by actual events delivers excitement and suspense that are…UNSTOPPABLE!